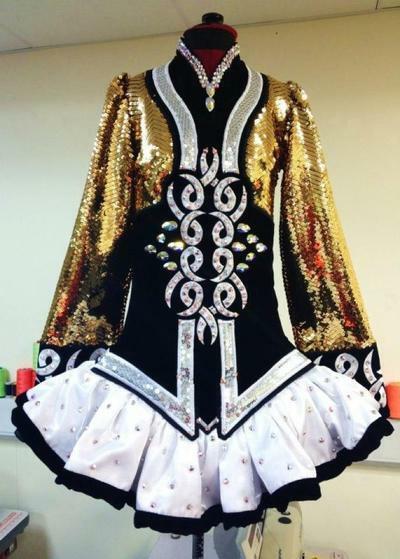 STUNNING CELTIC STAR DRESS,ONLY BOUGHT IN MAY 2012 FROM THEIR NEW COLLECTION,HIGH COLLAR,LOTS OF GLITTER,VERY BLING,VERY SAD TO SELL BUT TOO BEAUTIFULL NOT TO,SELLING DUE TO RETIREMENT.KICKPANTS AND CAMELLIA ROSE TIARA INCLUDED.ABSOLUTE BARGAIN PLUS BARGAIN SELLING PRICE,GOOD AS NEW,NO STONES MISSING AS ONLY BEEN WORN A HANDFULL OF TIMES. THERE IS STILL ROOM FOR GROWTH PLUS ALTERATIONS. Asking Price: £600. Shipping costs are not included in the asking price. Sale is final.